The cauldrons at your local Starbucks have been bubbling and boiling with their latest creation - the Witches Brew Frappuccino! 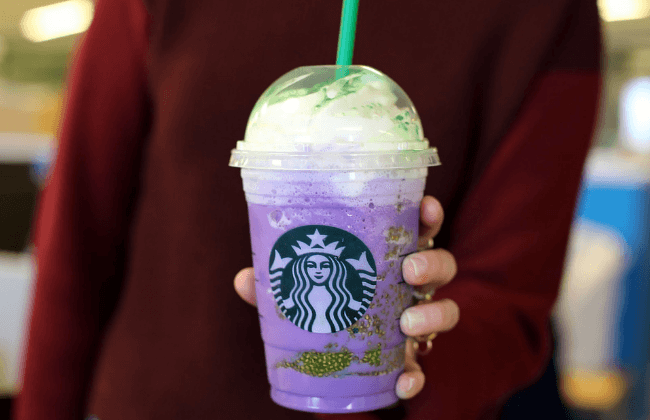 According to the Starbucks press release, the charming concoction is a purple blend of toads breath and orange cream Frappuccino with a swirl of bat warts and topped with vanilla whipped cream and dusted with green lizard scales. While we're not entirely sure what that means, we can tell you that this drink tastes of juicy, orange creamsicles. The so-called "bat warts" are really slimy chia seeds, and the crushed lizard scales is a generous helping of green matcha powder. 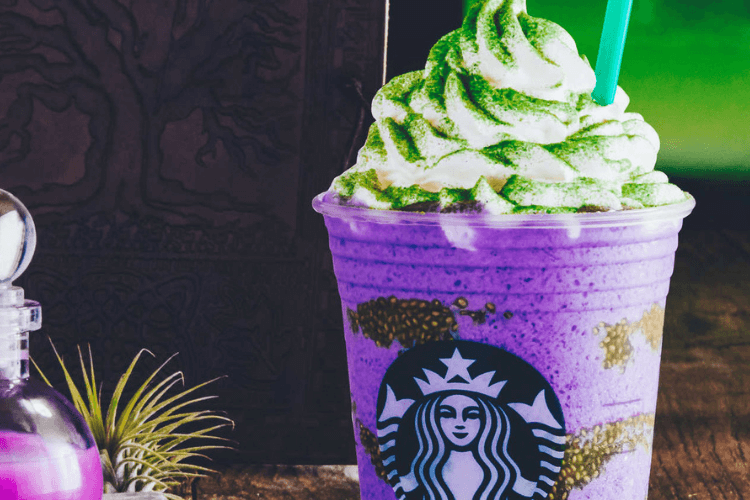 In comparison to the usual frappes that you can find in Starbucks, you won't have to shell out a pretty penny for this gorgeously spooky drink. The Witch's Brew Frappuccino is available for just $5.45, which is the same price as all of the usual, non-seasonal frappes. With bright purple creme and trendy ingredients like chia seeds and matcha powder, this drink is surprisingly affordable for all of the spooky delight and juicy flavors that it offers. Starbucks fans have been waiting for this year's Halloween-themed delight with baited breath. Halloween frappes have been a tradition since 2014 with the debut of the Franken Frappuccino. In the following years, Starbucks released the Frappula Frappuccino and deliciously undead Zombie Frappuccino. And now it seems as though the Witches Brew has joined the ranks of Starbucks fame, while also giving a playful shoutout to the Anderson Sisters. In addition to the Witches Brew, you can expect to find a few more spooky sugary treats at your local Starbucks. One new addition is mummy cake pops, which are vanilla-flavored cake pops that dressed up as a mummy for Halloween with feature glowing green eyes and a chocolatey coating. While you're there, be sure to catch one of the raccoon sugar cookies while you still can, because these adorable woodland creatures are just too adorable to miss. This new frappe is available starting on October 25th and can be found in Starbucks stores in the U.S., Mexico, Canada, and select locations in the Caribbean. Unfortunately, the Witches Brew will be returning back to its crypt and is only available while supplies last. We suspect that this drink is going to vanish for good on Halloween night, but don't fret! With the holidays just around the corner, you can expect even more charming holiday drinks to appear.